Part of the extended VW family, the underrated Seat has the quality of a Golf without the price tag. Seat has always been the four-wheeled underdog of the Volkswagen stable when it comes to brand semantics. We all get that aspirational Audi sits at the top of the heap, sensible Skoda brings up the rear, while classless VW is squarely in the middle. All are sisters under the skin, so the resulting range cleverly achieves multiple brand bangs for every buck invested in actually bashing metal. Sehr gut. But the Spanish make's place in this pecking order is less clear. Presumably meant to deliver a little Mediterranean fun and sunshine to counter all that Teutonic severity, a straw poll of friends suggests that a fair number of potential customers don't even realise that the Catalan carmaker is, like so many of those beachside villas in Llafranc, actually under German ownership. But the ill wind of Dieselgate blowing back across the Atlantic may work to Seat's advantage. As the fallout from the scandal hits sales (and possibly residual values) of VW's core brand, Seat's semi-detached status could become something of a saving grace. 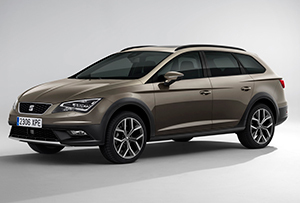 Thus for those in the know, this Seat Leon X-PERIENCE provides VW quality without the newly acquired eco-baggage. While for those who aren't, it is just like a Golf, only cheaper. The seats are comfy, the interior snug but pleasantly finished. Slick Bluetooth mobile connectivity is marred only by the number of menus one has to navigate to set it up in the first place. It's a decent drive too, the laid-back engine, well-weighted steering and compact dimensions adding up to a respectable motorway cruiser that is also pleasingly wieldy on narrower back roads. Even the potentially gimmicky four-wheel drive and raised ground clearance on this model (responsible for the shouty X-PERIENCE moniker) made for reassuringly sure-footed progress during a wintry weekend in Wales. Fuel consumption fails to live up to the hype - two litre-ish diesels seem to have been returning a real-world 45-50 mpg for a decade or more - but you could hardly call it thirsty. It looks presentable too, tidy styling enhanced in this case by metallic bronze paint, optimistically christened Adventure Brown. So you really could mistake it for a Golf, whose platform and mechanical underpinnings it shares. In fact I did, pointing the plipper at a VW of the same hue, parked not in Barcelona but in drizzly Crickhowell. Perhaps Seat's hour in the sun is dawning, after all.